Are your students accessing braille from their iPads, iPhones, tablets, and computers? The Focus 14 Blue combines comfort, portability, and advanced features for the ultimate go-anywhere Braille interface device. A highly responsive 8-dot keyboard and seamless USB and Bluetooth® connectivity make the Focus 14 Blue the ideal note-taking companion for smartphones, iPads®, tablets, and other mobile devices. The ElBraille is a state-of-the-art portable notetaker with a computer docking station specifically designed for users who are blind or deaf-blind and have a desire to be connected – at school, while at home or for active people on the go. The ElBraille was designed to be the “take anywhere” replacement device for the dedicated braille notetaker and combines the power and flexibility of a modern computer running Windows 10 operating systems with JAWS and a Braille display with a full Braille keyboard. This combination provides a fully accessible compact computer. ElBraille – a computer docking station for your Focus 14 Blue Braille Display. 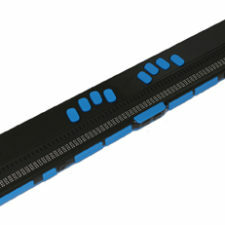 The Focus 40 Blue is a 1.43lb powerhouse refreshable braille display with braille keyboard that connects wirelessly to most any computer or tablet (using Bluetooth®) to provide braille access to what is on the screen of any digital device. 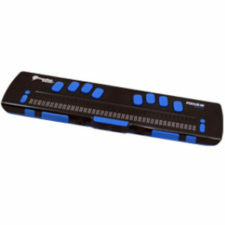 Focus 40 Blue features 40 cells and an 8-dot keyboard with easy to use thumb key and panning buttons. It has a smooth-to-touch feel and comes with VariBraille to let you choose your personal favorite firmness. Brailliant BI 80 display is designed for extensive reading with the full comfort and intuitive display navigation of HumanWare blindness products’ signature thumb keys. Instant Connectivity: Connecting the Brailliant to your PC no longer requires the installation of additional USB drivers to recognize the display. 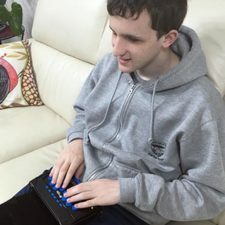 Just as you connect a keyboard or mouse, the PC will instantly identify the Brailliant enabling immediate access to your braille display. Improved stability for Brailliant USB connections: Regardless of the number of connected devices that you use, the Brailliant remains connected with your screen reader. The Brailliant BI 40 Braille Display is small and portable and great for a student, business use, as well as home use, as well as for anyone wanting Braille on the go. 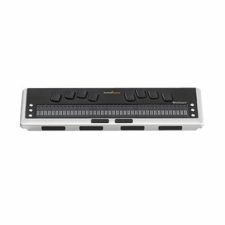 The Brailliant BI 40 Braille Display is designed for extensive reading with the full comfort and intuitive display navigation of HumanWare’s signature thumb keys. 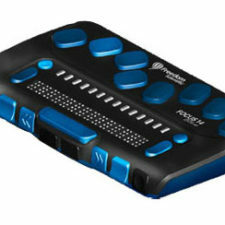 This 40 cell Braille display with Bluetooth can be connected to a computer with a screen reader, Mac computer, iPad, iPhone or an iTouch. 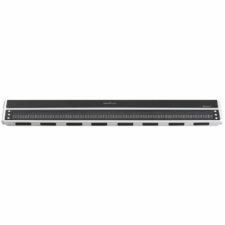 The Brailliant BI 40 has braille input and output, giving you the ability to read and type in Braille. To learn more about these or any of our products and services or to schedule a no obligation demonstration, contact a Technology Specialist at New England Low Vision and Blindness to learn more. You can also call our toll free number 888-211-6933 or email us at info@nelowvision.com.